Paul was the greatest fantasist of all. He created the Christian myth by deifying Jesus, a Jewish Messiah figure whose real aims were on the plane of Jewish political Utopianism. Paul transformed Jesus’ death into a cosmic sacrifice in which the powers of evil sought to overwhelm the power of good, but, against their will, only succeeded in bringing about a salvific event. This also transforms the Jews, as Paul’s writings indicate, into the unwitting agents of salvation, whose malice in bringing about the death of Jesus is turned to good because this death is the very thing needed for the salvation of sinful mankind. The combination of malice and blindness described here is the exact analogue of the myth of Balder, in Norse mythology, in which malice is personified by the wicked god Loki and blindness by the blind god Hother, and both together bring about the salvific death which alone guarantees a good crop and salvation from death by famine. Paul took the cosmic drama of good and evil from Gnosticism, and so took over also the dramatization of the Jews as the representatives of cosmic evil. But, by combining the myth of Gnosticism with the myth of the mystery cults (which were not themselves anti-Semitic), Paul sharpened and intensified the anti-Semitism already present in Gnosticism. The Jews became not just the opponents of the figure descended from the world of light, but the performers of the cosmic sacrifice by which the heavenly visitant brings salvation. The Jews thus become identified as the dark figure which in myths of the deaths of gods brings about the saving death – Set, Mot, Loki; and the stage is prepared for the long career of the Jews in the Christian imagination as the people of the Devil. The elements which Paul took over from Judaism to embellish his myth- the religio-historical element which set the death of Jesus in a panorama of world history- only intensified the resultant anti-Semitism, because there was now an aspect of usurpation in the Pauline myth, an incentive to blacken the Jewish record in order to justify the Christian take-over of the Abrahamic ‘promises’. The career of the Jews in history began to be seen as a prefiguring of their central role, the murder of the divine sacrifice; they were separated from their prophets, now regarded as proto-Christs, hounded, like Jesus, by the Jews. Maccoby was a brilliant scholar with amazing insight. And Christian apologists hate him. I have this amazing and revealing book and value it highly, but my one disappointment is that there are not enough citations. Maccoby was great, Jim. There are a lot of citations and extensive bibliography in that book, but at the same time Maccoby’s work on Paul was truly pioneering. It was unique at the time when scholars of traditional Judaism wouldn’t touch him while the Christian scholars in the so called “New Perspective on Paul” were falling over themselves trying to redeem the true founder of Christianity by dragging him into the Jewish fold. The critique I have of Maccoby’s Myth maker is that his view of Paul doesn’t fit with what scholars know to be factually correct regarding the dates of the NT texts, what we know of whom we received the texts from, or what we know about the method in which we received the NT textual sources. Let me hopefully explain. This author Hyam Maccoby also wrote the book “revolution in Judea” wherein he essentially argues very clearly how Jesus was just a very run of the mill pharisaic teacher, who observed halacha, though it was mixed with apocalyptic messianic aspirations. What Maccoby doesn’t tell his readers is that all of the textual information he gleans about the original Jewish Jesus and his halacha for his first book, was written, preserved, transmitted, etc. by the followers of Paul of Tarsus exclusively. Did you catch that? I’m saying that the earliest strata of the NT books that come down to us are only written and preserved by Paul and his followers. All of the manuals of discipline that the Church uses, (and consequently make up the sources that scholars use to reconstruct Jesus’ halacha) come down to us only from Pauline (usually gentile) Christian sources. These facts weaken Maccoby’s central hypothesis that it was Paul himself who de-Judaised Jesus. If Paul was truly the source of a DE-Judaised Jesus of Nazareth, he did the worst possible job, because had he intended to expunge Jesus’ Judaism, we wouldn’t know about a Jewish Jesus at all . All of Paul’s epistles insist as the core of their ethics and praxis that gentiles should follow basic rules for G-d fearing gentiles, ie what we call today noachide laws. Paul did not want non Jews to become Jewish, but that is a very different thing then making Jesus antinomian or calling him G-d.
All of Paul’s ethics come from second temple norms established for non Jewish converts. James Dunn’s Christology in the making demonstrates very well that Paul himself did not view Jesus as G-d, but as an intermediate angelic agent of G-d, (not unlike Enoch as described in 1 Enoch,) and not unlike the several pseudo-messiahs that have arisen since Jesus, such as the rebbe, without Christian involvement. Marcion is the true architect who attempted to remove all things Judaism from the Christian Bible. There is just too much textual data for J’s Judaism (to draw from) that COMES FROM PAUL to assume that he was the source of all the changes. CR, it has been several years since I read this book so I don’t remember the answer to my question, and I don’t have the book handy at the moment. What did Maccoby think the sources were, it not from Paul’s followers? CR, I don’t know where you got the idea that Maccoby claimed that Paul tried to “de-Judaize” Jesus. If anything, Maccoby makes a case that Paul attempted to use Judaism as a springboard for his myth, badly mangling Judaism in the process (since his own knowledge of the Jewish faith was, according to Maccoby, far from “Pharisaic”, despite Paul’s own boasting). He claims on the one hand that Paul used Judaism as a springboard, (in his vein attempts at sounding pharisaic, (not denying that Gene) but on the other hand, the thrust of his argument is that Paul was a convert who just marketed Jesus well and invented a theology diametrically opposed to Judaism. In revolution in Judea he builds up the picture of the perfectly Jewish Jesus who was a patriot for his people, who observed the law. He doesn’t make clear to his readers that this picture of Jesus likewise comes from Pauline Christians and their sources. He doesn’t talk about the fact that the sources for his reconstruction of a Jewish Jesus comes from Pauline sources, really. The issue Paul has with Judaism is a simple one. It is Paul’s observation that Ma’aseh haTorah (the Principles of Torah observance, or ones level of strictness via fences) may not necessarily equal greater holiness. Making a gentile into a Jew may not make such a person into a holy person, that’s what Paul taught, that’s what got him busted. Someone who is initially born Jewish (like Aaron for example,) may sin to a greater degree than someone who was born a gentile, (like Ruth for example,) and its the ultimate doing of the work that counts in G-d’s eyes, not the state in which you are called to serve G-d. In the second temple period, literally everyone was observing Torah to one degree or another. Sadducees had their form of halacha, pharisee’s theirs, qumranites had theirs, Samaritans theirs, Jesus’ followers had theirs, even G-d fearing gentiles had theirs, etc. And what still happened? A horrible plight still befell the people. I don’t know, I didn’t get that impression from his “The Mythmaker” book. While Maccoby does say that many of the later Christian works (including the gospels) were clearly influenced by Pauline thought, he doesn’t claim that all the writers somehow followed Paul to the letter. Nor does he ever claim that Paul himself tried to excise Judaism, the ancient origins of which he actually needed to make his new Jesus-faith appear legitimate, since novelty in religion was looked down upon in the ancient world. Marcion did attempt to move away from Judaism far more than Paul ever did, but there are very good reasons why he relied specifically on Paul and his writings to the exclusion of all others. Now, CR, why do you think that was the case? I don’t think drawing on the Norse Eddas is a good course to take. One could also find striking pagan elements of a world-encircling serpent who slays and is slain by his old enemy similar to the curse of Genesis, or a Ragnarok that sounds like Psalm 82’s apocalyptic disinheritance of the gods from their 70 nations while humanity survives its titanomachy. The blind agent motif is common in literature, and can be found in the Joseph story of a dead-reckoned brother separated from his blind siblings who witlessly enlarge him by their evil act, leading to a salvation from death by famine. I get what he’s saying, but it just seems fast and loose. One could be sawing off one’s own limb. Just my humble two cents. Drake, yes, it is, you are correct. However, Maccoby attempts to make the case that in his letters that Paul was specifically drawing upon his own intimate knowledge of the Roman cults. I wrote a post a while back about Church fathers themselves pointing to Roman pagan myths to make the case that Christianity’s ideas about Jesus were not as ludicrous as the pagan philosophers claimed – in fact they had clear parallels. The difference was that the pagan myths came from “demons” supposedly imitating the future coming of Jesus. The problem with drawing pagan links is that you can draw disjointed links to almost anything, that’s true. Thanks for fixing my typo. Here’s a question I am curious about. Totally unrelated. It’s not really about Jesus or NT. In Psalm 82, when G-d is calling out the other gods, is He personifying something that does not exist in order to condemn it? Or do they exist and are simply not to be followed? Angelos or malakh simply mean “messenger.” It describes a task performed, not what those elokim actually are in their ultimacy. Christian commentators inductively scrape out that the elohim are the parts of the Trinity, which is reaching. Especially since HaShem rebukes them in the Psalm and others like it. Drake… Psalm 82 is about corrupt human judges, as is clear from context. Elohim also means “judges” in Hebrew (as is clear in Exodus 22:9, for example). That makes me think. What about Deuteronomy 32? What does the word “demons” means. As far as I understand, there is no such a thing as fallen angels. Angels are all obedient to G-d. This word “שֵׁד” definitely has something to do with “idols”, but why did we translate it as “demon”? What does “demons” means biblically? All concordances say that לַשֵּׁדִים is a loan word – so it’s not an original Hebrew word, but of a foreign influence. This means, as I believe, that “demon” is not a real entity at all, just like “gods” are not real entities from a biblical standpoint, but came from idolatrous religions. Same goes for whenever they are mentioned in Babylonian Talmud and other post-biblical Jewish literature – it was very common in the ancient world to believe that demons were real and this superstition has even influenced post-biblical Judaism (mainly through superstitions, such as demons living under fingernails). And even more so, much more so, Christianity, where demons and devils play a crucial role. I used to believe that, but Ugaritic myth describes a northern mountain run by a god called El. His consort bore him 70 sons that sit a level below him on a blue sea of glass, if I’m not mistaken. Also in Exodus. Then 1 Kings 22 does the same thing with a prophecy against Ahab, evoking their 3-tiered caste of heaven. Clearly not judges. See Deuteronomy 32:8, the honest translation. It’s like those tortured interpretations that the Daughters of Men had 12-foot offspring simply because they were from an immoral line. All the while, Mesopotamian literature points to the apkallu meddling too much in human affairs until they were banished to the undergloom to become chthonic rulers. The ancients weren’t thinking giantism had anything to do with the ethical fortitude of the lines. I don’t think the philosophical and ethical dimensions of Judaism were honed until later. And in those contexts there is only one way to read such stories. I mean, Og’s iron bed was the same exact dimensions as that of Marduk in the Etemenanki ziggurat, where he would supposedly meet Sarpanit and make love to her to fructify the land. The Rephaim, the underworld rulers of Bashan of Canaanite lore, were mentioned in Enoch and Deuteronomy. And Daniel uses the term Watcher in the one region of the world where their title originated – Mesopotamia. Later commentators (Rabbis and Christians seem equally guilty of it) try to gloss over clearly numinous texts by making them into ethical fables neutered of their mythic flavor, or saying gods means something other than gods by translating them as “angelic beings.” The Mi Kamocha falls apart under that. Not exactly a soaring panegyric. The Bible seems, in my humble understanding, to suggest the existence of beings created by HaShem that fit all the pagan criteria for gods; extremely powerful – but still limited – beings that can manipulate order from the unseen realm. G-d, on the other hand, is depicted as the only infinite one, the only first cause of they, us, and the world, and the only one worthy of adoration, the true Ein Sof. A good example of what shedim meant can be found in Brevard Childs’ “Myth and Reality in the Old Testament.” Brief read, very meaty. They were local protector tutelaries; benignly perceived gods who often controlled a small domain. Not “demons.” There is a glimmer of what they expected from their local votaries in Exodus 4 with the Bridegroom of Blood incident, which was circumcision as a substitute for prima nocta. Weird, huh? “Demon” is a later Greek word. Angelos or malakh describe an errand, not a persona. This leaves only one other option. Maybe calling them gods is too stark. Call them “powers.” But 1. they are said to exist in the Bible, 2. “demon” is a late category and 3. angel is merely something they do. 4. Divine Assembly pantheon imagery is redolent in the Tanakh. 5. All are situated as HaShem’s creations like us and every animal, limited and unworthy of worship or attention. That seems to be the order of things in the World Unseen of the ancient. Mythology has been my hobby horse for some time. Homer, Ovid, Tolkein, Gilgamesh, Hesiod, Virgil, etc. There is something I think that Christians and Jews are guilty of in this overall debate, and it centers around what they choose to call “pagan.” Within collective myth, there is the Universal which applies to all of Mankind, transcending considerations of pagan and monotheist. The Jungian. Man and his symbols. 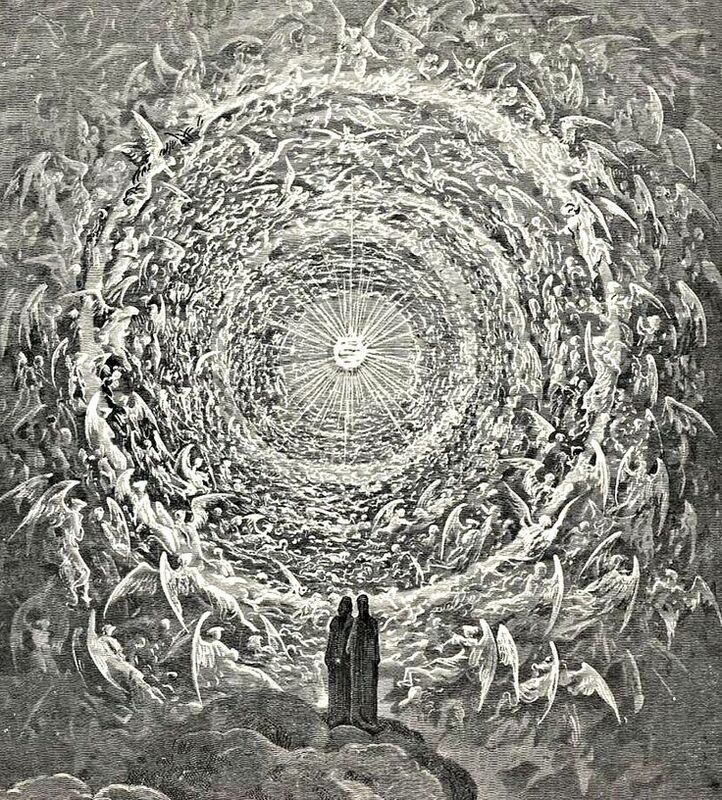 Dante’s White Rose of Heaven reveals a Trinity that he describes a mystically paradoxical. He strugglingly describes it like a mathematician wishing to square a circle. In the eastern mandala, the sand art is often built off of concentric squares and circles spreading from a vertex. In the Bible, a wheeling skydome sits atop a four-cornered land. At this point, I ask if the circle/square motif is uniquely “pagan,” or if it’s simply a universal mystery to all humankind who live under its shadow, expressing itself across cultures. Perhaps the artist or poet is expressing the ineffable mystery that creation itself is an improbable absurdity; why is there anything at all? As the form of a fetus tapers to its umbilical and outside source, a paradox of such magnitude can only be sustained from without itself, rendering all continued existence a miracle. We could ponder endlessly. On the other hand, worshiping a golden calf – an image of desire, immanence, matter, and fertility within Creation – that IS uniquely pagan. And so I ask if G-d would speak to Man in the color palate of his dreams and symbols, or simply dowse his dancing bonfire and start over whole cloth. Having dabbled in comparative myth since my dad gave me Gilgamesh at 14 in a state full of Indian mounds where I amassed a collection of African art before high school, I can say this with utmost confidence: those who would evoke the mythic to detract from another’s beliefs will find that it can be a sword that slashes against its own wielder. It’s shattered and rebuilt my own beliefs – painfully – many times before I felt secure with HaShem. If those are the terms, I can leave Moses just as much a fabulist as some allege Paul to be. But as you know, I respect both. Drake, is worshiping a man as god “uniquely pagan”? To be god and to be worshiped as one, has it not been the desire of many a pagan ruler? Temples, mountains, and even clouds and fire. None of these things did G-d actually create in His own image. To suggest that G-d would allow Himself to dwell in all except the one thing bearing His image seems to amputate the trajectory He sets through the Tanakh, filling smaller and smaller crannies as He goes. It does not seem radical to me to aver that G-d is also my Messiah, as opposed to having to wait for salvation from a mortal. In that way, G-d remains the source of all redemption needs no mortal intermediary to qualify His gift. Straight shot. Should I worship G-d directly in the name of Messiah, or should I just treat the Rabbi, G-d’s cloak, like the Shekhinah and bow? Do I agree with the neatly packed Trinity doctrine? It’s a mystery I’m not really smart enough to square at this point in my life (no geometric pun intended). Amid the pillar of cloud, the Ruach, the Shekhinah, the Sephirot, Wisdom personified in Mishlei, Torah before creation, I really have not sorted out how best to direct worship to a G-d with so many sock-puppets in the show. Seems that arm is in each one. It’s late. I have a date with my comics. *Seems His arm is in each one. Drake, this comment is not directed at you, but I want to segway to a concern I’ve had for a while when contemplating how far we go and where we choose to stop when we astutely explain Christianity. For me personally, the rhinoceros head in the room is that if we are willing to engage in the rational disentanglement of the rise of Christianity from Judaism, paganism and mythology, and of Judaism from Ugaritic and Canaanite origins, even invoking universal symbolism — which I believe is the rational thing to do — then do we stop with Hashem? Why? Are we remaining intellectually honest with ourselves? Is life really a miracle from an outside source? What religious adjustment will we make if and when we find evidence of ancient life forms on Mars, such as that which Catholisim made when it finally had to acknowledge that the Earth wasn’t the center of the universe? Asteroids and meteorites are laden with water and other organic molecules. Experiments have shown the spontaneous creation of the structures of life. Hawking states the universe, including life, doesn’t require God as an explanation. then do we stop with Hashem? Why? Are we remaining intellectually honest with ourselves? Jim, Judaism answers itself in this question. You aren’t stopping with G-d, because you were never actually at G-d.
G-d has no image, that includes the image that Judaism has of G-d. If we are intellectually honest about what is meant by no image, it means G-d is irreducible to the level of the human imagination and mind. That is the real paradox between the monotheist and polytheist position. The polytheist recognizes all forms of worship as “image” based, (because of the limitations of the human intellect in grasping the divine.) If you ask a polytheist his perspective on monotheism, he would say that the Jewish view is just as much an image or likeness of the infinite as is any religion. That’s why polytheism is more egalitarian in certain respects. It does not place a patent on the nature of the divine, or its characteristics. More likely they were attempts by Christians to figure out how to explain why they believed that man Jesus can be G-d and yet they were still “monotheists” when they were being accused of hypocrisy by the pagans who noticed the obvious incongruity. Only G-d can forgive sins. Don’t put other gods before the L-rd. Jesus is the mediator between G-d and man. Oops… And that’s why the trinity came to be. To explain the contradictions. Just as anthropomorphism is used in the Torah for its’ audience in the 8th to 10th centuries BCE. Isn’t that the whole raison d’etre for God? After all, if God is utterly indifferent to the affairs of man, then what is God other than some indefinable source that explains otherwise inexplicable forces of nature? And if so, then there is really no need to entertain the existence of God in the first place, let alone write books about “Him”. I don’t think there’s a comparison, if only because Christians tried to introduce ANOTHER “god” person into the mix, and THEN attempted to legitimize their not-so-new idea of “god in three persons” in monotheistic terms. My comment was from a perspective taken a few steps back; not so much as to the differences between monotheism and polytheism, but as to explaining the nature and existence of God to begin with. If further response to your comment Gene, it seems to me — and I may be wrong on this — that Paul, at least in his early writings such as 1 Thessalonians, did not equate Jesus with God, but presented him as God’s son and intended earthly ruler, who God resurrected from the dead and who would return to save those who believed in both God and son from the coming wrath, and who would transport the faithful back up to heaven with him. Thus, Paul describes Jesus as God’s angelic/prophetic representative savior on earth, but not as God Himself. It was after Paul when the Church fathers turned Jesus into God Himself, perhaps because they, not having any of Paul’s Jewish background and orientation, couldn’t seem to hold on to his distinctions. I think you are right Jim. mostly John seems like he deify Jesus, but Paul sees Jesus as the messiah without explaining clearly who he is.